Read about Professor Abhay Pandit's proposed talk to be held at Materials Today's New Scientist Live event on 23 September 2016. Our identity is transient; it is often a culmination of our interaction with environment we live in. The factors that affect our identity are complex and often not limited to the people that surround us. In our ageing society, chronic disease also has a ‘personalized identity’. If we were to work on any therapy for these chronic illnesses we need to develop adaptable treatments that are personalized. Just as individual identity is transformed with communication with others we are designing materials systems that engage tissues at a cellular and molecular level to modulate their disease states. More importantly current research paradigms are not only harnessing the body’s self-healing mechanisms but are also looking for inspiration in nature’s own adaptive systems. This talk will illustrate these paradigms with specific examples from our laboratory as well as in the field. 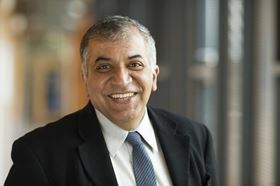 Abhay Pandit, PhD, Established Professor of Biomaterials at the National University of Ireland, Galway, is Director of the Centre for Research in Medical Devices (CÚRAM), a multi-disciplinary academic-industry-clinician translational research centre. His research interests’ focus on the development of next generation targeted controlled-drug-release reservoir delivery vehicles which facilitate spatiotemporal localised sustained delivery of multiple biomolecules to target injury mechanisms at the molecular and cellular levels. These macromolecular complexes form functional interfaces between implanted devices and biological systems to endow the former with bio-responsiveness and/or biological function. He has published over 210 papers in peer reviewed journals. He is a Fellow of the Tissue Engineering and Regenerative International Society and an International Fellow in Biomaterials Science and Engineering – the first Irish academic to receive this honour. Read about Nicola Marzari's proposed talk to be held at Materials Today's New Scientist Live event on 23 September 2016. Read about Dr. Eleanor Schofield's proposed talk to be held at Materials Today's New Scientist Live event on 23 September 2016. Read about Emma Lundberg's proposed talk to be held at Materials Today's New Scientist Live event on 23 September 2016. Read about Professor Mark Miodownik's proposed talk to be held at Materials Today's New Scientist Live event on 23 September 2016.